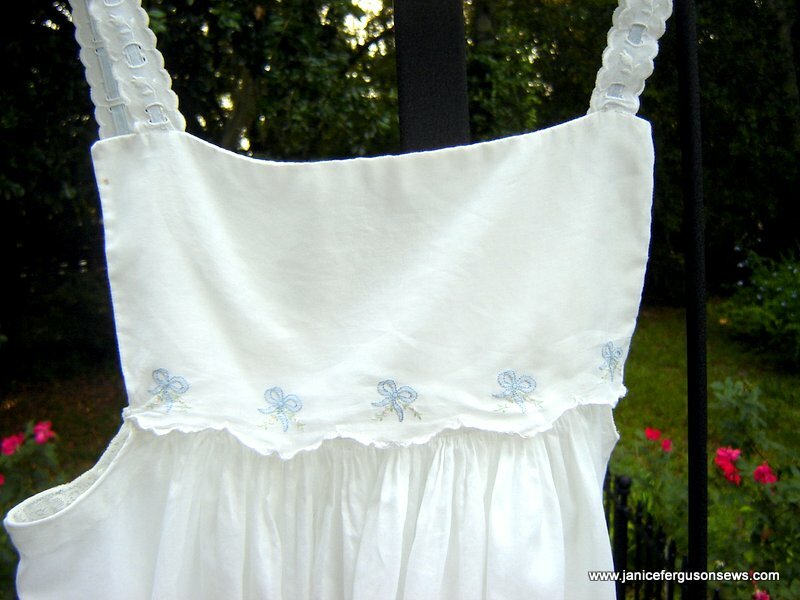 Stitching a nightgown is always a pleasure. 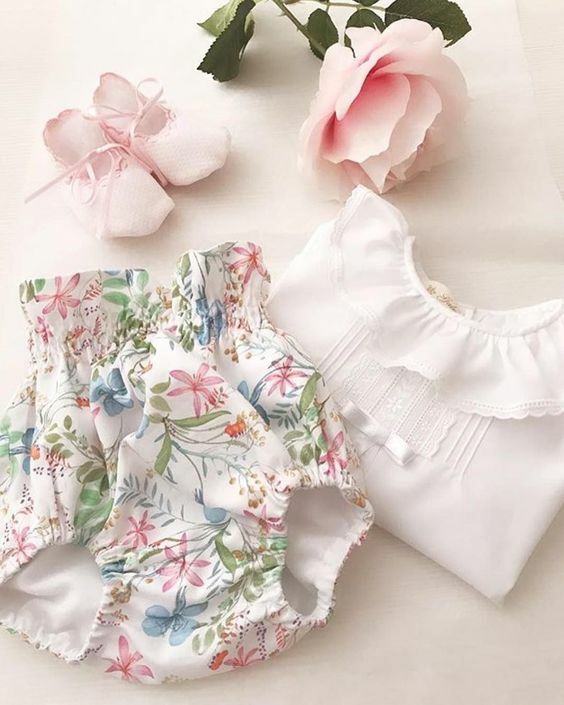 Often made as gifts for birthdays, holidays or bridal showers, pretty sleepwear is appreciated by ladies old and young. This gown was made for my daughter when she was a teenager. 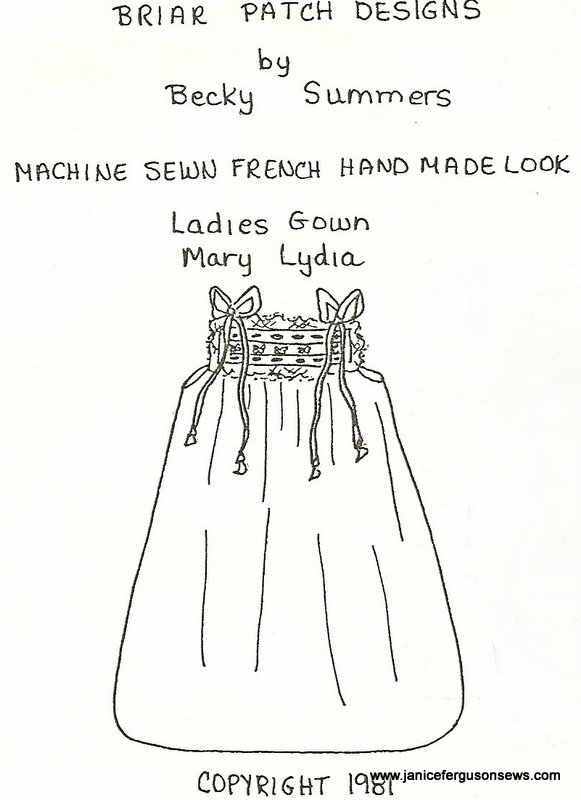 The pattern, Mary Lydia, is an old, all time favorite of mine. Its versatility allows you to use goods of any width. The armhole curve is placed over the finished fancyband and dips into the skirt fabric. 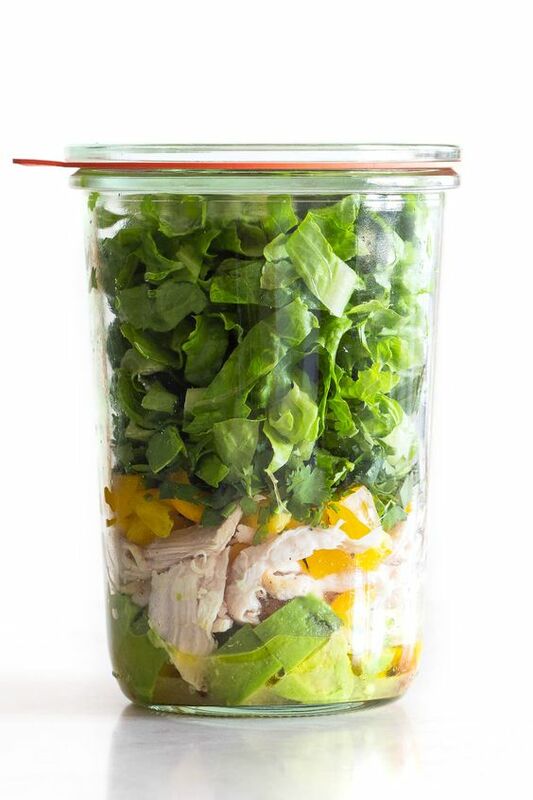 It is also suitable for a sundress. Made of all Swiss goods–batiste, galoon beading, blue bow handloom insertion and edging–it is guaranteed to present sweet dreams. This handloom is one of my all time favorites. SWISS HANDLOOM. It is exactly like hand stitched shadow embroidery. SWISS HANDLOOM back is consistent with hand stitched shadow embroidery. Even though I often hesitate to be “instructive” for fear of offending many of you who are likely well informed on the topic, I’m going to tell you about it anyway. 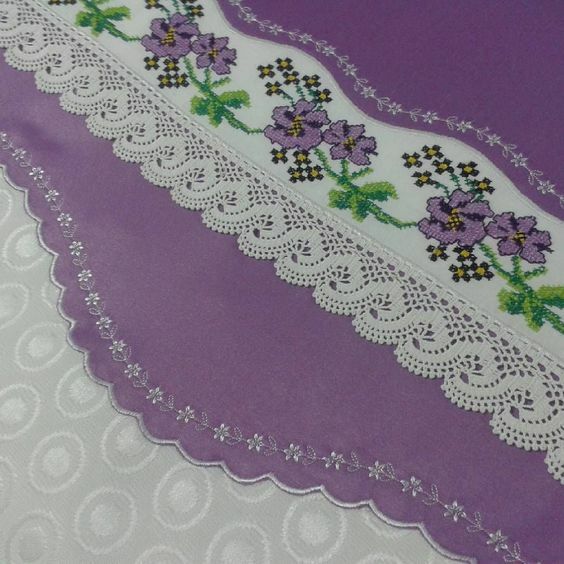 For the few beginners amongst us I am going to give my standard classroom “lecture” on the difference between Swiss handlooms and Swiss embroideries. Now, I make no claim to be an expert on any subject, least of all the history and development of heirloom goods. But the information I am sharing with you was given to me by reliable sources, so I trust their accuracy. For generations, the making of Swiss handlooms has been a cottage industry.A family would focus on one particular pattern and invest in the “handloom” to make this pattern. They were mechanized but not motorized, thus the name hand loom. The size of the loom was limited by the size of the room in which it was housed. Almost always, that measurement was approximately 4 1/2 yds–13 1/2 feet. That would be a good sized work room. So a true handloom never comes in a greater length than 4 1/2 yds. Cottage industries hold less and less allure for young people, eager to move on–I imagine to get out of the Alps. I envision the old movie Heidi with it’s picturesque cottage and majestic mountain scenery. This scene likely had more appeal to a 6-7 year old girl than to a young adult who has lived there all his/her life. Mr. Russell at renowned M.E. Feld Company told me that many of his customers were purchasing handlooms in anticipation of their predicted “collector status” and sure-to-follow price hikes when they are no longer being made. These beauties are so expensive that they are being sold by the quarter yard for $15-20. My first thought was sure! You can ask any price you want, but does anyone buy them? There were several that were listed as “SOLD OUT” so it seems they do. I was shocked to find the sweet little floral design shown on the peach bishop dress (with the smocking design in the previous post) is now available for $60 py. I don’t recall the exact amount, but it seems when I bought it in 1981, oblivious to the distinction between Swiss handlooms and Swiss embroideries, the price was $8-10 py. If my next grandchild is not a little girl (still a twinkle in her daddy’s eye and expected to arrive no sooner than April, 2012) , my personal stash of these handlooms will be for sale in the “store”. But the prices will be much less than those mentioned above!!!! But I digress…….Swiss embroideries are simply very fine machine embroideries on Swiss batiste. They can come in any length, made as they are on a motorized machine with no limitation on length other than the length of the piece of fabric being embroidered. SWISS EMBROIDERY blue bow, wrong side. Note white bobbin thread. Apparently, the handloom had unique capabilities. 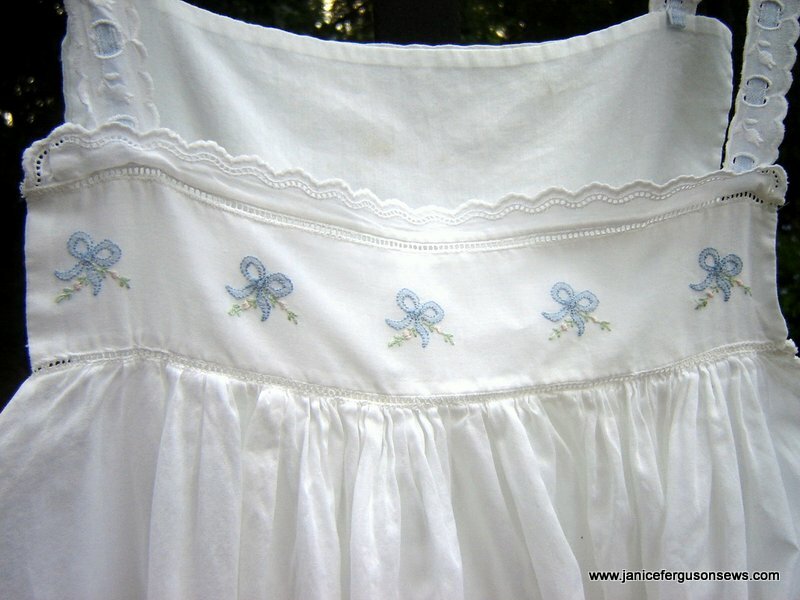 It is hard to imagine how the shadow embroidered blue bow was stitched on a machine. It is not consistent with Suzanne Hinshaw’s technique, which certainly could not have been used before washaway stabilizer was available. Yet, seeing the Swiss embroidered bow, I think I could reproduce a reasonable facsimile on my embroidery machine. Except for these shadow embroidered pieces and other delicate unique designs, I don’t see any big advantage to a genuine handloom over a well made Swiss embroidery, except perhaps for the thrill of using a collectible item. This may be more than you wanted to know. If you have read this far, please let me know if you find this “lecture” helpful or if you would rather just read brief details about the pictured project. And now, speaking of the project, who doesn’t have sweeter dreams when wearing a pretty nightie, with or without handlooms? 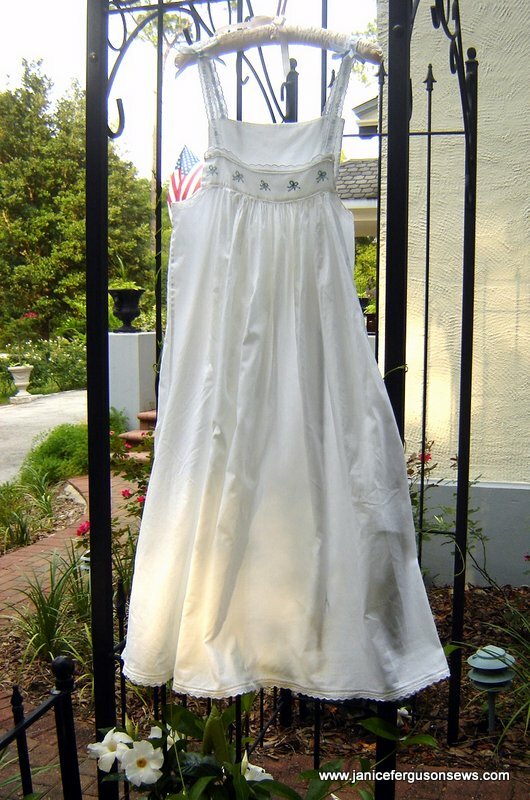 This entry was posted in heirloom sewing, ladies, Tutorials and tagged heirloom sewing, ladies heirloom gown, Swiss embroideries, Swiss handlooms. Bookmark the permalink. I read all the way to the end and I like the details. You told me things I didn’t know about handlooms, which I have always loved. 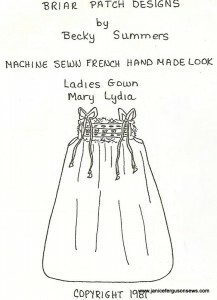 I’d like a post on the different types of laces: bobbin, leavers, etc. I’ve heard the terms, but I don’t know the differences. Also, what is the difference between crochet and Irish crochet? Inspiring, as always, thanks! I enjoyed this post very much. Wish I’d had the for sight to collect them….and a few other things! Thank you for this wonderful and informative post. I was fortunate to stash a few pieces of Swiss handlooms. My plans are also for a sweet little granddaughter someday. May our wishes come true, and our lovely stash be used! I read to the end, and I found it very helpful. Thanks! 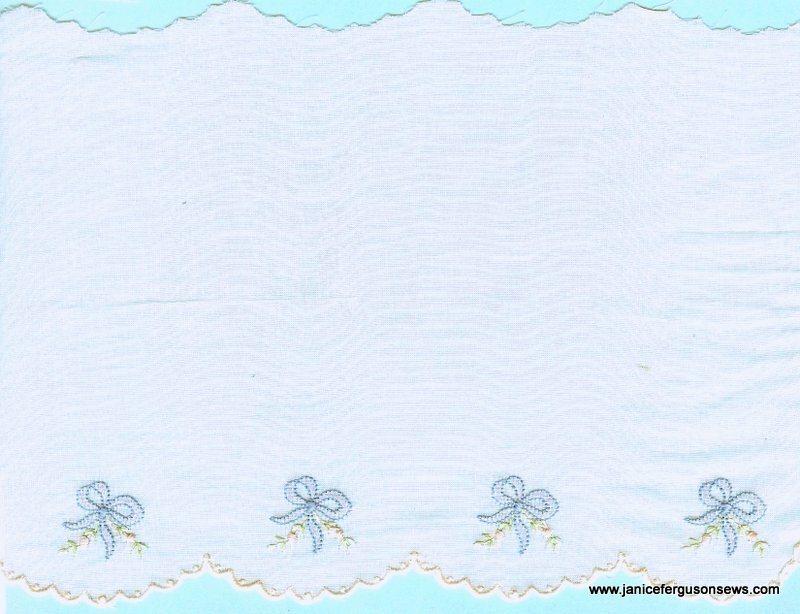 Janice, I also read to the very end because I did not know the difference between hand looms and swiss embroideries, I really appreciate your “lesson” for those of us who know nothing and want to know more. I always find your postings so informative and appreciate you taking the time to post and I love seeing all the beautiful garments you have created. Thanks to each of you who let me know you enjoy this sort of post. I am afraid you have turned me loose for more such informative posts. It like teaching from home! I love it. I enjoy reading the history and “technicalities” of special products and techniques. It makes me appreciate the resulting garments so much more. Sarah, thanks for your input. I’m glad you enjoyed that information. from Martha Pullen forum: I have a small piece of those bows Janice! They are beautiful as is your gown. Sara, I do not have a copy, but you might want to check eBay or Farmhouse Fabrics. 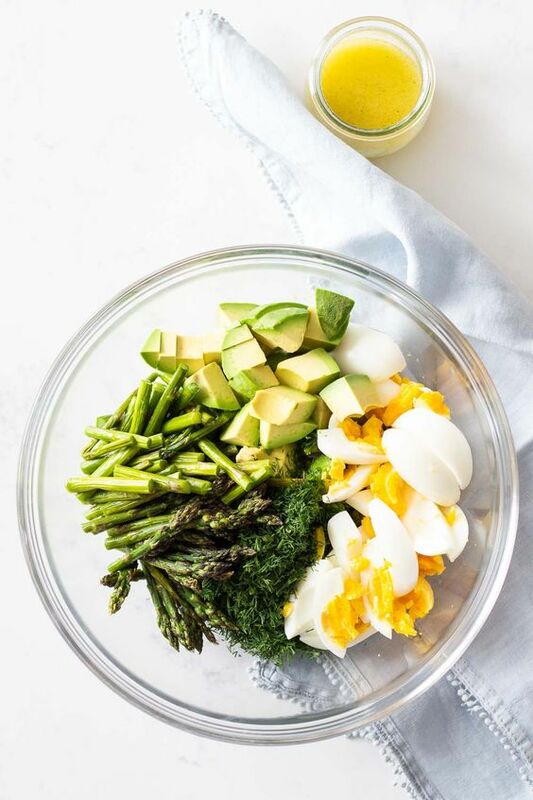 It is a very old pattern, but it is excellent and so versatile.